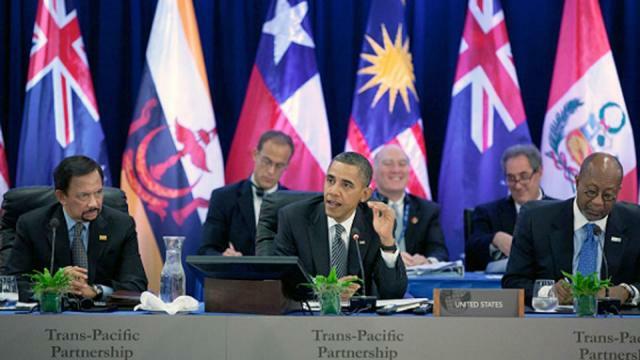 The following is the first installment of a three-part exclusive for Occupy.com on the Trans-Pacific Partnership. In 2008, the United States Trade Representative Susan Schwab announced the U.S. entry into the Trans-Pacific Partnership talks as “a pathway to broader Asia-Pacific regional economic integration.” Originating in 2005 as a “Strategic Economic Partnership” between a few select Pacific countries, the TPP has, as of October 2012, expanded to include 11 nations in total: the United States, Canada, Mexico, Peru, Chile, New Zealand, Australia, Brunei, Singapore, Vietnam and Malaysia, with the possibility of several more joining in the future. What makes the TPP unique is not simply the fact that it may be the largest “free trade agreement” ever negotiated, nor even the fact that only two of its roughly 26 articles actually deal with “trade,” but that it is also the most secretive trade negotiations in history, with no public oversight, input, or consultations. Since the Obama administration came to power in January of 2009, the Trans-Pacific Partnership has become a quiet priority for the U.S., which overtook the leadership role in the “trade agreement” talks. In 2010, when Malaysia joined the TPP, the Wall Street Journal suggested that the “free-trade pact” could “serve as a counterweight to China’s economic influence,” with Japan and the Philippines both expressing interest in joining the talks. In the meantime, the Obama administration and other participating nations have been consulting and negotiating not only with each other, but with roughly 600 corporations involved. The TPP is accelerating the most dangerous free market policies of previous U.S. administrations, bestowing unprecedented powers and privileges upon Trans-National Corporations (TNCs) while dismantling regulations and laws without any democratic oversight or input. This three-part investigative series examines the Trans-Pacific Partnership, a legally binding trade agreement for advancing transnational corporate tyranny and dismantling domestic democratic accountability. To prove this point, it would be useful to quickly glance over the biographies of the important U.S. Trade Representatives (USTR) since the George H.W. Bush administration, when USTR Carla A. Hills was lead negotiator for NAFTA and the WTO. Embedded within the U.S. foreign policy establishment, Hills had a long career in government and was the USTR from 1989 to 1993, after which she established and became CEO of Hills & Company, an international consulting firm with a focus on global trade and investment for clients such as the Coca-Cola Company, Procter & Gamble, American International Group (AIG), Novartis, Bechtel, Boeing, Rolls-Royce, Inter-American Development Bank, Pfizer and Chevron. A few accolades: Hills is a member of the board of the Council on Foreign Relations, Gilead Sciences, and is on international advisory boards for Rolls Royce, the Coca-Cola Company and JPMorgan Chase. She is also a member of the Trilateral Commission, the Peterson Institute for International Economics and the Center for Strategic and International Studies (CSIS). Following Hill, from 1993 to 1997, the U.S. Trade Representative was Michael Kantor, who now advises corporate clients as a partner in the law firm Mayer-Brown. A member of the board of CBRE (a real estate services company), Kantor also serves on the advisory boards of ING USA and Fleishman-Hillard, a public relations firm. Next in line, from 1997 to 2001 the USTR was Charlene Barshefsky, who is now on the boards of American Express, the Estée Lauder Company and Intel; like Hill, she is a member of both the Trilateral Commission and the Council on Foreign Relations. The USTR from 2001 to 2005 was Robert Zoellick, who afterwards served as Deputy Secretary of State, Vice Chairman of Goldman Sachs from 2006 to 2007, and President of the World Bank from 2007 to 2012. Following Zoellick, from 2005 to 2006, the USTR was Rob Portman, a U.S. Senator who was a possible running mate for Mitt Romney’s presidential campaign. And only after him did Susan Schwab, the USTR from 2006 to 2009, commit the U.S. to joining the Trans-Pacific Partnership. Schwab has since joined the boards of FedEx, Caterpillar and Boeing. Based on the evidence of her and her predecessors’ tenures, it is safe to say there has been a significant interchange between “trade representatives” and “corporate representatives” — to the point where it is almost impossible to distinguish them apart. Now let’s get even more caught up to speed on appointed “government officials” so we can know exactly what we’re talking about. Within a week of becoming president, Obama changed his mind and his “transition team” (responsible for selecting the Obama cabinet) became co-chaired by John Podesta, co-founder with his brother Tony Podesta of the Podesta Group, a major Washington lobbying firm. Podesta was Bill Clinton’s former chief of staff and, as co-chair of Obama’s transition team, he declared his team was implementing “rules that are the strictest, the most far-reaching ethics rules of any transition team in history.” A top lobbyist whose firm has represented clients ranging from Wal-Mart, BP and Lockheed Martin to the Egyptian military dictatorship, Podesta appeared the ideal figure to implement Obama’s “strict” rules against hiring corporate lobbyists, right? A little further background: the Podesta Group counts among its recent lobbying successes the stalling of a Senate bill which was calling on Egypt “to curtail human rights abuses.” The Group’s website also boasts that it “challenged” Wall Street reform after “one of the world’s largest banking firms came to the Podesta Group seeking help with their opposition” to proposed regulations for banks. Thus, it should come as little surprise that part of the “strictest” and most “far-reaching ethics rules” announced by John Podesta in relation to lobbying was that no official could be appointed to the Obama administration if s/he had been an active lobbyist within the previous two years. Luckily for Ron Kirk, Obama’s U.S. Trade Representative, these “strict” rules only applied to the Washington D.C. area; and since Kirk was a corporate lobbyist in Austin, Texas, for the investment bank Merrill Lynch (before it was taken over by Bank of America in 2008), the “far-reaching ethics” promised by Podesta didn’t reach Kirk. Kirk’s main priority since becoming USTR has been the Trans-Pacific Partnership, worked on in secret for nearly four years with several other countries and 600 corporations. President Obama has called it “a next-generation trade agreement” and a “model” for future agreements. In May of 2012, more than 30 legal scholars from nations that will be affected by the TPP signed a letter addressed to USTR Kirk expressing their “profound concern and disappointment at the lack of public participation, transparency and open government processes in the negotiation” of the TPP. Part of these “high standards,” according to a meeting of the Asia-Pacific Economic Co-operation group (APEC), are “deep commitments that go beyond tariff reduction and pass existing World Trade Organization standards.” In other words, it goes far beyond “trade.” This was confirmed by Iwan Azis, the head of the Asian Development Bank’s regional integration office, who stated that the TPP was intended to deal with “behind the border” issues, typically decided by domestic policy, and “which go beyond the normal scope of trade agreements” including issues of labor, environmental and intellectual property standards. The aim of the TPP appears to be in establishing a core “trade bloc” in order “to create a gravitational force that would bring others in,” according to Karan Bhatia, the Vice-President for international law at General Electric and a former deputy U.S. trade representative. Ultimately, this objective includes bringing both Japan and China into the fold. What Horlick referred to as the “least transparent trade negotiations” he had ever seen, Kirk referred to as “the most engaged and transparent process” possible. Perhaps this can be explained by the fact that Kirk has access to the draft document and observes and participates in the negotiations, unlike the representative bodies of governments or their populations. So let’s call this what it is: a transnational corporate coup over the democratic process and public accountability. Indeed, this is “practical.” After all, as he explained, if the talks were not done in secret, the public would be aware of what was being discussed, and if the public knew what was being planned, they would oppose it. So secrecy is necessary in order to make the agreement as undemocratic and unaccountable as possible, to ensure that corporations get what they want while the public remains in the dark. Deceptive and saturated with disdain for democracy, certainly, but “practical” nevertheless. Part II of Marshall’s investigative series on the Trans-Pacific Partnership will appear Wednesday. By Andrew Gavin Marshall in Asia, Canada, Economy, Global Governance, Globalization, Politics on November 19, 2012 . I’m thrilled President Obama won (the alternative would have been much, much worse)–but he’s not perfect–we need to hold his feet to the fire on the TPP agreement; the FCC debacle with his appointed chairman who is handing over the airwaves to media conglomerates such as News Corporation (Murdoch); charter schools, which are a handout for private corporations receiving federal money for schools that not only are not better than public schools, but are leaving out the majority of students; religion in government; Gitmo detainees who have been held for years without trial; an unaccountable Wall Street that helped Bush cause the 2008 collapse and have paid no price for their actions; and free-speech protesters arrested or moved to the miles away from those they are protesting. This is our chance as citizens who voted him in to have him do what’s right. These trade agreements are horrendous for the US economy, our children are not being educated, and our media is being taken over by those with a definite political bias–meaning, as has been the growing problems for years, we have no real voice for the truth, and will have even less as Murdoch and others complete their takeover of the airwaves.